Bitter principles (lupulin containing humulon, lupulon and valerianci acid), volatile oil, flavonois, polyphenolic tannins, oestrogenic substances, asparagin. Can be combined with Valerian and Passionflower for its sedative properties. 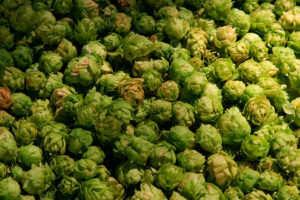 Contraindications: Do not use hops preparations in depressive illnesses. It should be avoided as it may exacerbate the condition. Excessive doses over a prolonged period of time may produce dizziness and intoxication which may disturb the ability to concentrate.